If we don't have the part in stock we will help you the part. Most spare parts are in stock. Emergency parts can be next day delivery. For other parts can usually be delivered within a week. You receive 1 ton of garnet for free after installation and training. You can purchase high quality rubbies, IDE heads. IDE is an option for our customers. We sell quality nozzles at a reasonable price. 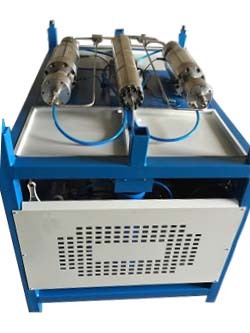 CNC vertical ultra-high pressure waterjet cutting machine is a new technology breakthrough. 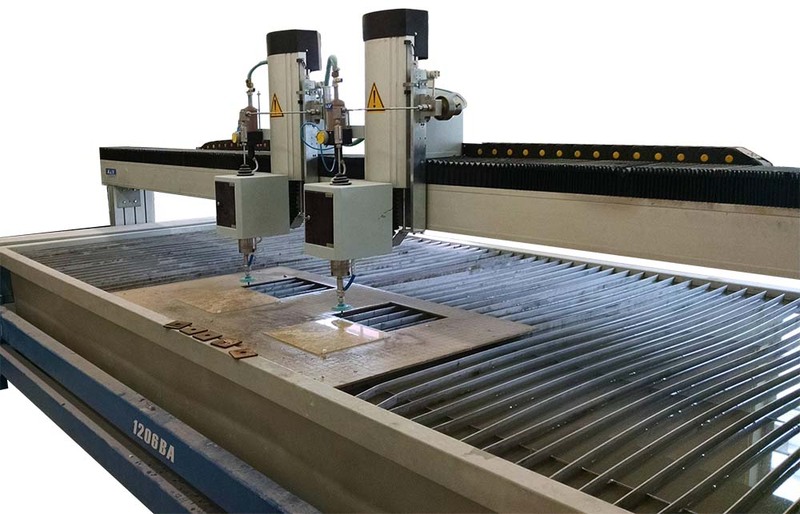 This waterjet is a paradigm shift compares to the tradional ultra-high pressure waterjet. 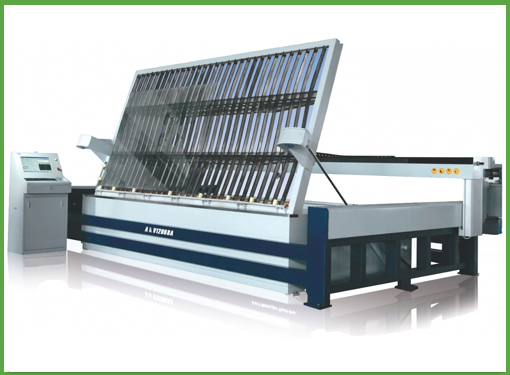 It allows vertical creative cutting, improves efficiency, and reduces waste materials. 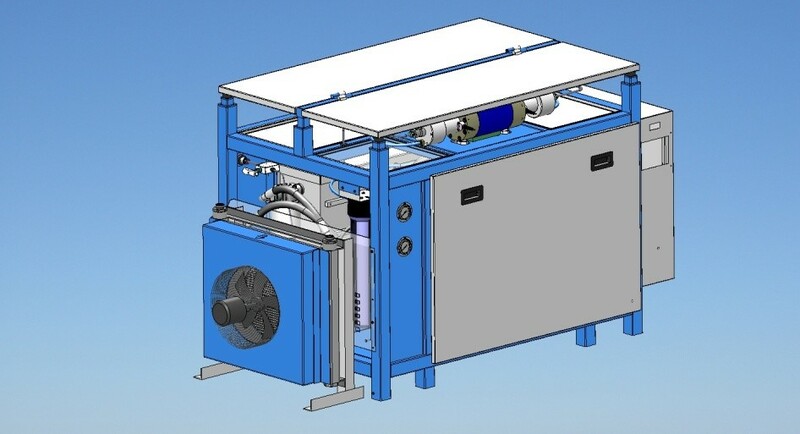 Water cooling system: The system is able to provide cooling water and cutting water for the intensifier pump. Main features: Cooling water can be recycled. Water is cooled in the water storage tank, which also provides cutting water for the Intensifier Pump. 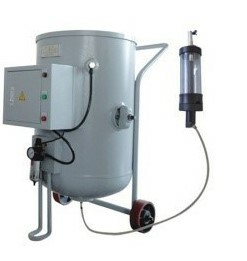 When the water level in the storage tank drops, it will automatically fill water into the tank. The whole system only occupies very little area. 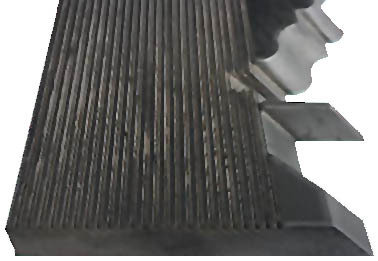 structure: air cooling heat exchanger and oil connection pipes. with the oil well cooled. 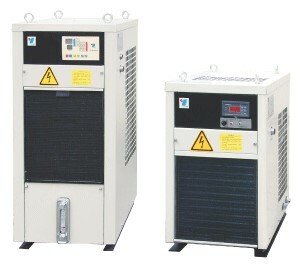 Main features: Save water; better cooling effect. 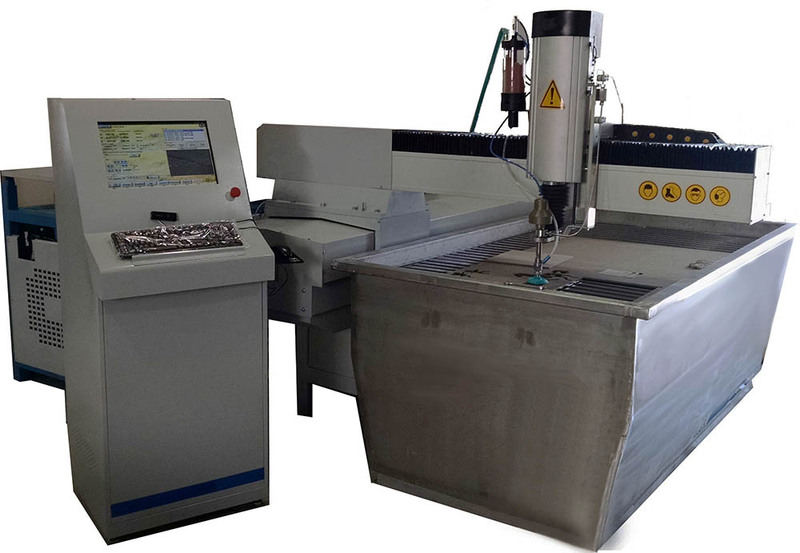 This awesome multiple z-axis machine improves producion efficiency and reduces processing time. The distance between the 2 axis can be adjusted automatically and programmed to work together or to work separately. TWO BEAMS are better than one: This awesome multiple beam machine improves production efficiency. The distance between the 2 different beams can be adjusted automatically and programmed to work together. 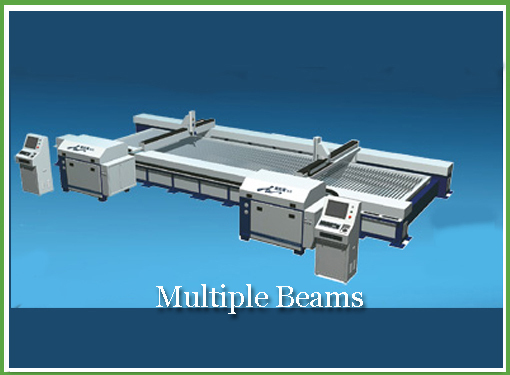 Every beam is controlled with a single control system and can process different orders at the same time. Ten reasons why you should purchase! 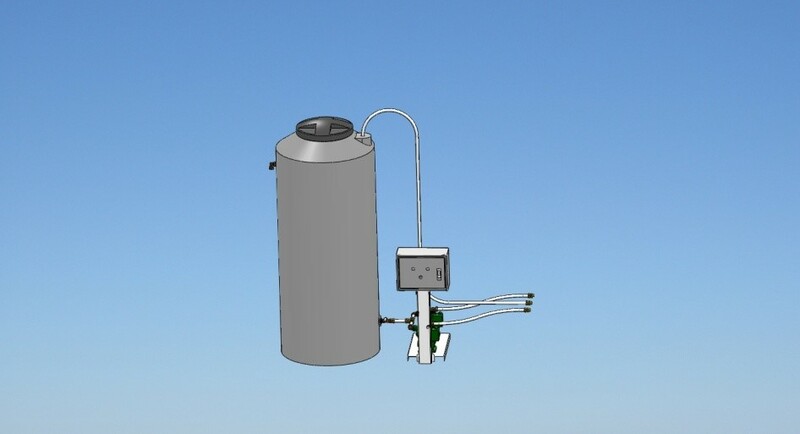 A 50HP high pressure intensifier. (working pressure 55k psi) Cut 2 inches of titanium! One year Warranty, we strive to have a two business hour turnaround time for all routine technical issues. Flexibility in Manufacturing, You will be able to cut: Aluminum sheets, stainless, iconel, composites, stone, foam, glass, plastic, leather, tile, paper, food, rubber and many others. Machine does the Lifting: Hydraulic lifter: This platform can flip upwards. Thus, this movement allows the operator to have flexibility to load and unload materials. 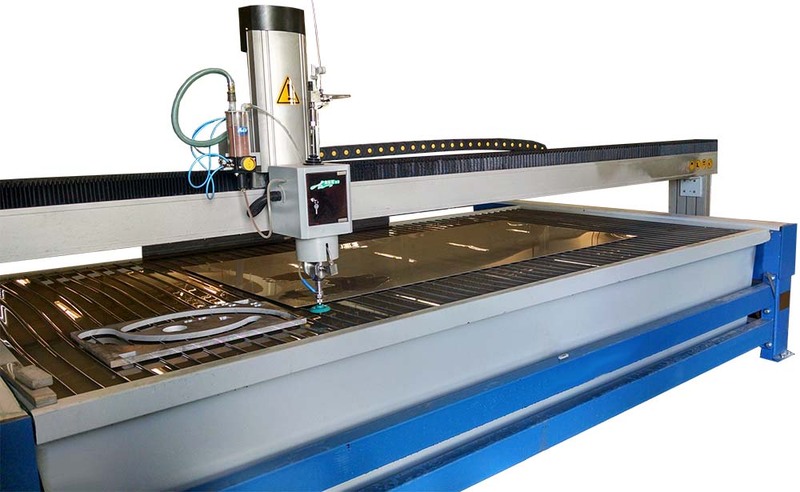 Hydraulic flip waterjet cutting machine is one of the latest style machines which combines the assemble of both glass semi-automatic loading and CNC ultra-high pressure waterjet. This machine has the same advantages of glass semi-automatic working. 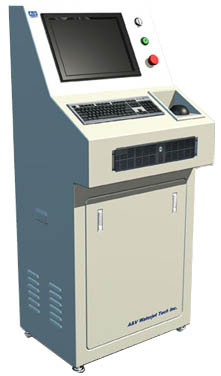 This machine reduces the broken rate during operation, less manual labor, and increases work efficiency.This machine processes wearing parts. 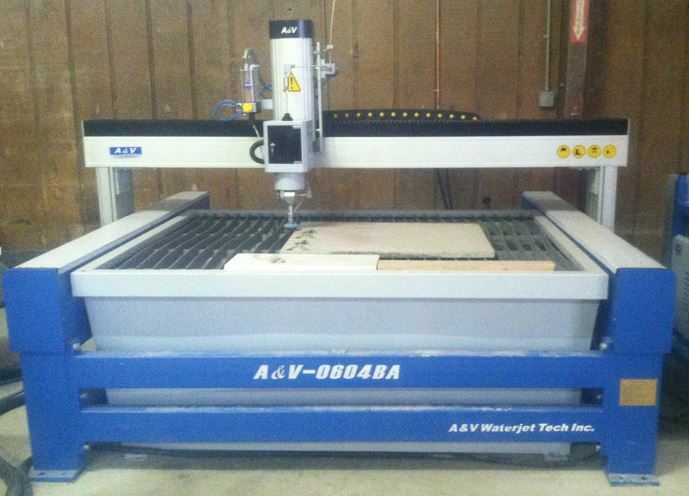 5 Axis: 5 axis CNC Water Jet with a 12 x 6 table is affordable for you shop. 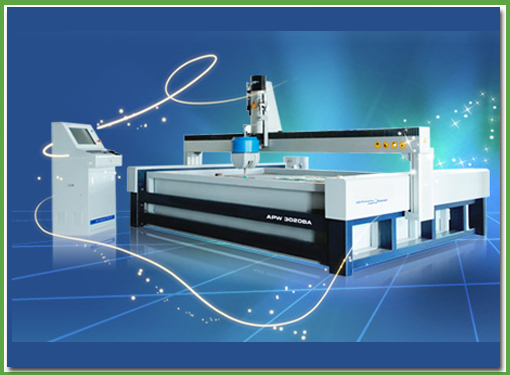 In this particular five axis design,one CNC ultra high pressure water jet cutting head contains at least five axis the biggest advantage of the five axis water jet design is that the cutting head can rotate in any direction, which can produce a preset cut level at any angle. 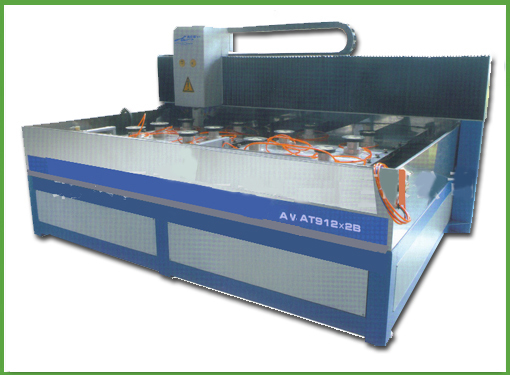 As a leading high tech manufacturer of ultra high-pressure abrasive water jet cutting machines. 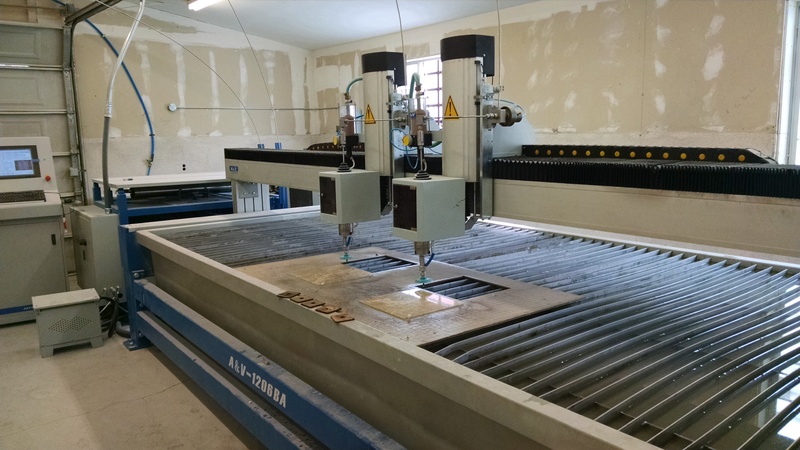 Through dedicated research and development, our waterjet cutting machines are playing an important role in processing metal, steel, titanium, marble, stone, granite, glass, ceramic, plastic and composite materials. With established reputation in quality, service, and unbeatable price, our products are enjoyed by our customers worldwide. 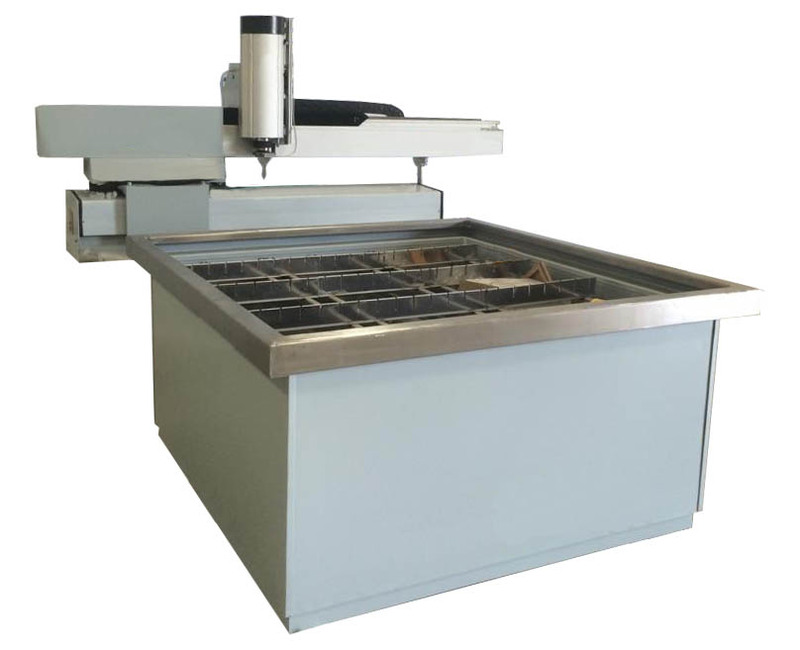 In this particular five-axis design, one CNC ultra-high pressure waterjet cutting head contains at least five axis (three linear coordinates and two rotating coordinates) with coordinated processing motion through CNC. 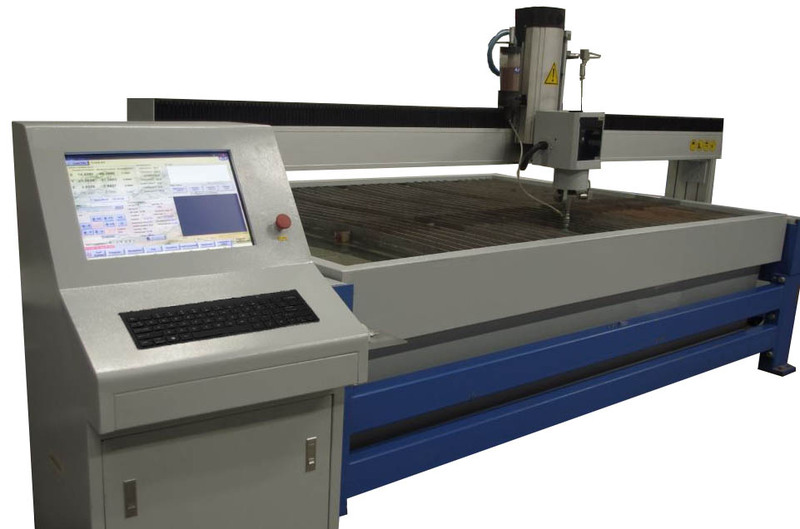 Compared to an ordinary waterjet cutting machine, the biggest advantage of a five-axis waterjet design is that the cutting head can rotate in any direction, which can produce a pre-set cut bevel at any angle. 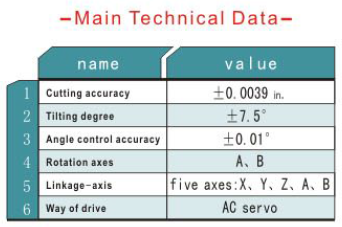 According to material type and its thickness, different angle settings can be controlled through computer software, which gives you the ability to have no tapper on your finished cut edge. 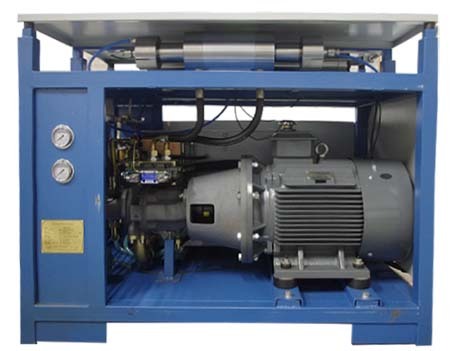 Our high pressure pump combines all the advantages for waterjet cutting applications. High-pressure technology has set the standard in this field, offering unrivaled efficiency, high continuous load capability and availability. 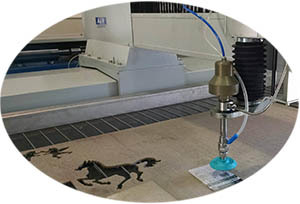 The CNC five axis ultra high-pressure water jet cutting machine utlizes the five axis control software in traditional high-pressure water jet control system. The machine body and supporting table (water tank) have a separate structure. This design eliminates any negative impact to cutting accuracy as a result of any change in the supporting table. This highly stable structure is easy to be locally updated and maintained. The supporting table is fairly sturdy for heavy load and is corrosion resistant. The grizzly screen is made of stainless steel, which can be removed or installed at ease. 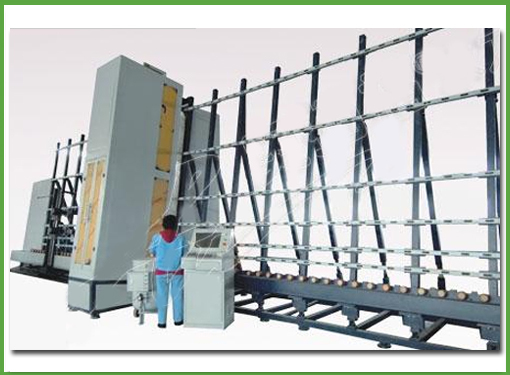 The bridge frame of the cutting platform has dual motors, dual direction, double pulse control and synchronous system for a logical structure, high rigidity and smooth transmission. Z-axis is automatically controlled through programmable software, which has 5-axis linkage and an auto tool setting function. AC Servo Motor offers reliable control and excellent acceleration. Ball screw and linear guide guarantees the transmission accuracy, with durability and high quality. The installation of effective dust guards stops the abrasive and water erosion on the ball screw and linear guide. 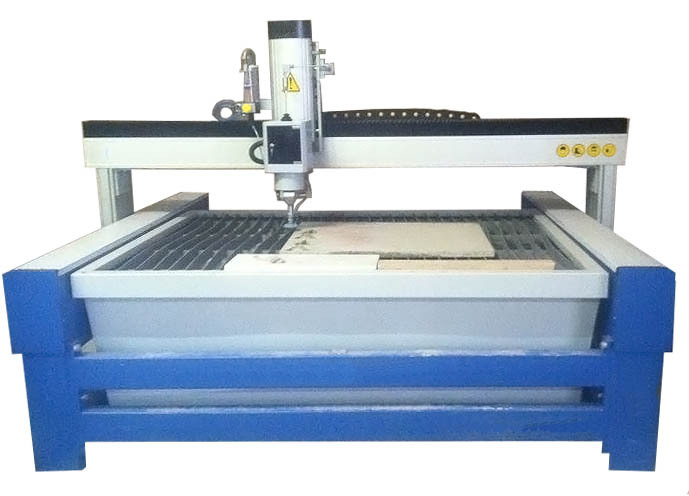 Details CE Certificate ISO 9001: Certificate Matches Multiple Cutting Heads, Professional Waterjet CNC System and Following Device System. We are not only able to offer reliable products, but also to provide highly appreciative value proposition. 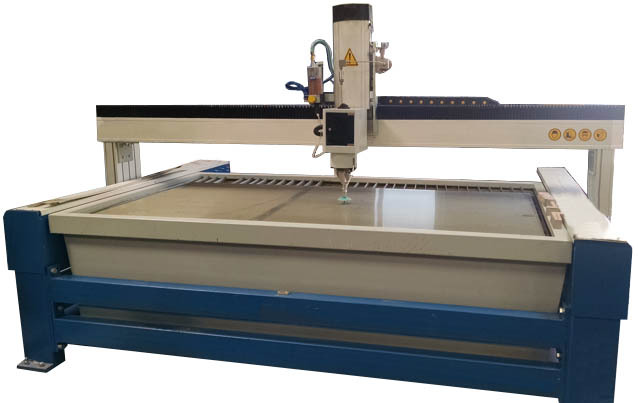 While the same water jet platform cost hundreds thousands dollars more, our reliable products cost 30 to 60% less than the competitors water jet platforms. We sincerely invite you to come and see our products and let us give your company a price quotation. A 50HP high pressure redundant intensifier. (working pressure 55k psi) Cut 2 inches of titanium! Flexibility in Manufacturing, You will be able to cut: Aluminum sheets, stainless, inconel, composites, stone, foam, glass, plastic, leather, tile, paper, food, rubber and many others. Accept DXF file created by AutoCAD and Solidworks, it can work for other cam software but it needs to be confirmed prior to purchase. The main benefit of a four axis cutting head is to compensate taper, and to make the finished it completely vertical through the fourth axis. This specially engineered cutting head has perform remote markedly in many cutting feels and reducing the processing cost of increased operating efficiency. It has a maximum limit of 10 degree angle with the rotational accuracy of 0.01 degrees. For taper compensation, the distance between the cutting head and the surface of the work piece must be maintained with high accuracy. 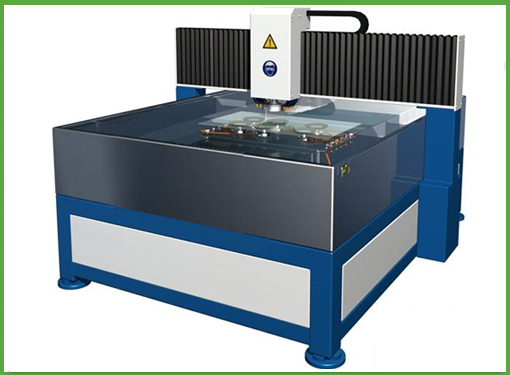 The height positioning accuracy of the four axis is 0.01 mm positioning cutting accuracy. 0.1 mm, which can easily meet various cutting requirements. In the marble matching process, water jet cutting with a four axis cutting head design is simply amazing. When the angle of the cutting head reaches 4 degrees, the finished edge shows tremendous improvement. As can be seen from this picture, there is no gap between the two joint services. Hence a secondary polishing procedure is no longer required. Thereby, it increases working efficiency and reduces the production cost. With this improved four axis dynamic cutting head design. Marble matching is no longer a difficult technique. It has made the traditionally complex marble matching an easy job. The same methodology is also applicable in glass straight hole drilling. 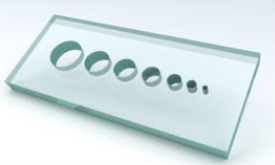 As an example, when piercing holes in the glass. It is not necessary to decrease the cutting speed in order to get straight holes. The ideal effect can be achieved without changing cutting speed, and that is highly beneficial! Air Valve to prevent jams and breakages. Some special technical issues may require video conferencing, engaging with our business partners. We aim to have these types of issues resolved within eight business hours. The bridge frame of cutting platform has dual motors, dual direction, double post control and synchronize system for logical structure, high rigidity and smooth transition.